Moreover, it can easily and quickly achieve PowerPoint to video conversion within the embedded effects, including animations, pictures, video clips, audios and even transition effects. Powerful customization functions are also provided for bettering the slides. Moyea PPT to video converter can support wide range of PowerPoint versions (PowerPoint 2010, 2007, 2003, 2002, 2000) and output formats (MP4, AVI, MKV, MOV, FLV, H.264, MOV H.264, MP3, FLAC,WAV, Ipod, ipad, Apple TV, etc.). It is able to convert PowerPoint to video, PowerPoint 2010 to video, PowerPoint to movie, PowerPoint to AVI, PowerPoint to MP4, PowerPoint to WMV, PowerPoint to MOV, PowerPoint to flash video, PPS to MPG, PPS to AVI and PPS to MP4, etc. It is also able to directly convert PowerPoint to mobile devices such as iPod, iPhone, iPad, PSP, Pocket PC and Blackberry, etc. 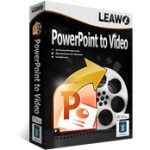 This PowerPoint to video converter provides you powerful customization functions. You are allowed to set the slide transition timing, mute the original audio files in a selected PowerPoint file, insert as much background music as possible and change the aspect ratio of the PowerPoint file. Besides, you can add your own watermark to credit your work or as an advertisement. Moyea PPT to video converter is capable of capturing a complete PowerPoint presentation including animations, sounds, transitions and movie clips to its video copy. With the powerful conversion app, everything you intend to convey in a PowerPoint presentation will probably be conveyed in its correspondent video. Meanwhile, this PowerPoint to video converter support batch conversion and carries a friendly user interface, thus it can convert PowerPoint to video as quick and easy as you wish. Even a beginner can well operate it. Moyea PPT to video converter is absolutely the best PPT to video converter we tested. It can well realize the PowerPoint to video conversion without any trouble as well as maintain the original animations, video clips, pictures, audios, etc. The Powerful customize functions also help us to get better output slides. How to review and rate Moyea PPT to video converter? Moyea PPT to video converter can satisfy your needs of converting PowerPoint to videos and mobile devices. You can also rip audio from a source PowerPoint file to save as MP3 or other audios. Besides, it provides you multiple related customize functions for bettering the video slides. Thus, it is absolutely the best PowerPoint to video converter we tested. The output has excellent clear audio and video, let alone the problem of audio and video synchronization, audio distort, so that your PowerPoint would be easily accepted by YouTube, and thus much more people can share your PowerPoint. We found Moyea PPT to video converter can convert PPT to video in a fast speed out of imaginations. In addition, the batch conversion also saves us much time for the conversion. Moyea PPT to video converter carries a friendly user interface which is quite intuitive, thus even a beginner can well operate this software without any trouble. Actually, we don’t think you will need any help because this program really provide us a intuitive and friendly user interface, but any questions you can get help from the below ways: send an e-mail, forums, user guide, website F.A.Q, online chat and telephone support. .mp4, .avi, .mov, .rmvb, .flv, .ts, .vob, .mpg, .dat, .wmv, .asf, .mkv, .dv, .dpg, .3gp, .3g2, etc. Galaxy S, Sony Ericsson Xperia Play, etc. how to use Moyea PPT to Video Converter? Absolutely love this product. It is everything it proclaims to be, and is so simple to use. I am able to send it straight onto a flash drive to play perfectly on the TV. Have been wanting to find something like this for ages.